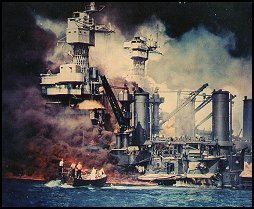 In a devastating Sunday morning attack, forces of the Imperial Japanese Navy launched an attack against the forces of the United States Navy at Pearl Harbor. 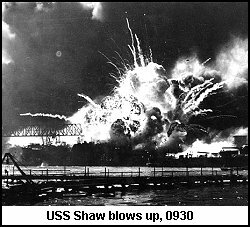 The air raid caught the American forces completely by surprise as two waves of bombers strike starting at 7:55.
occupied by Shaw is hit and starts to sink as fires erupt on the ship. Several fires start on Nevada and flooding is getting serious. The captain decides to beach the ship rather than have her sink and block the channel. Power for the dry dock is cut, leaving the Pennsylvania without electricity, reducing her ability to fire at the attacking aircraft. The tender Curtis is struck by a bomb which starts a fire on board. The main dry dock housing Pennsylvania and the destroyers Downes and Cassin begins to flood. The fire on Downes is out of control and the order to abandon ship is given. Another bomb hits the forward section of Downes causing yet another major fire. This one reaches the torpedo storage room and causes a massive explosion. Roosevelt meets with his “war cabinet” and orders the grounding of all private aircraft, the arrest of all Japanese and German aliens and prepares his speech to congress requesting a declaration of war. Some debate started on whether he should ask for a decoration against Germany, but FDR quickly put an end to this, indicating that he would not do anything to threaten the unity of the nation, as he felt such a request would give the isolationist Republicans an opening to cause trouble. A second major fire starts on the California on the main deck, starboard side. Secondary explosions on the destroyers Downes and Cassin are reported as fires reach magazines and torpedo stores. The fires on Shaw burn to the forward magazine and the bow is destroyed in a terrific explosion. Fires reaches ammunition stores on the destroyer Downes and the ship explodes, starting a minor fire at the bow of the Pennsylvania. Some destroyers anchored on the north side of Ford Island get underway. Some destroyers moored at the Naval Yard get underway. A fire starts on the bow of Maryland. The hospital ship Solace gets underway. The second wave of Japanese aircraft withdraws. The crew of California is ordered to abandon ship as advancing oil fires on the water threaten to engulf the ship. The stern fire on Maryland is out and the bow fire is under control. Shortly after all are off the ship, California is engulfed in flames that start numerous new fires. 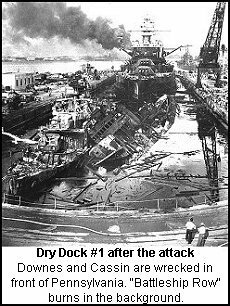 The main dry dock is flooded enough that on-board pumps and lines can start to be used to fight the fires on Pennsylvania and destroyers Downes and Cassin. 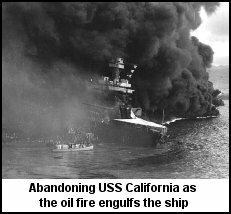 California was remanned and the abandon ship canceled as the oil fire subsided enough to allow men on deck. All Japanese aircraft are recovered. The flight officers passionately argued with Admiral Nagumo to launch a third attack against the facilities at Pearl Harbor. However, Nagumo had completed what he was ordered to do, did not know of the location of the American carriers and was still in range of land-based bombers and felt his forces had been fortunate to do what they had. He ordered the fleet back to Japan. Reports arrive at Pearl Harbor that Japanese bombers have hit Wake Island savaging the planes delivered there just four days ago by Enterprise. Maryland reports that all fires are out on board the ship. Japanese bombers based in Formosa hit Clark Field in the Philippines. Despite having over ten hours of warning, Macarthur chose to remain passive and did not execute the pre-war plan to use his B-17s to strike first. The American bomber force is destroyed and most of the fighter protection with it. The following outlines the events of December 7. All times are Hawaii local unless otherwise noted. An intercepted “Purple Code” (diplomatic message) message is in the hands of American intelligence services. A portion of the message received earlier in the day is translated the message instructs the Japanese consulate to inform the U.S. government at 1300 local time that all negotiations are at an end. A Japanese submarine launches 5 midget submarines who’s goal is to enter Pearl Harbor and destroy any shipping they can. Admiral Stark, chief of Naval Operations, is told of the intercept announcing the end of negotiations and the 1300 notification time. One of his staff points out that that is about sunrise in Malaysia and the Philippines, both of which are the suspected targets for Japanese aggression. No mention is made of Pearl Harbor. The Secretary of State Hull is briefed on the intercept. The destroyer Ward, on port patrol at Pearl Harbor, spots a periscope and begins operations against the suspected enemy target. After returning from his regular morning ride, General Marshall, Army Chief of Staff, is informed of the intercepted message. He immediately discusses a joint war warning with Admiral Stark. Stark is not concerned about the message and decides not to react to it. The destroyer Ward, having made no contact, breaks off the search for the enemy submarine. Two minesweepers, also on harbor patrol, pass the submarine nets guarding the harbor. Two Japanese midget submarines pass through the gate with them. General Marshall issues his war warning to Army units, but the message would not be received by all units, including those at Pearl Harbor, for several hours due to communications foul-ups. Admiral Nagumo launches the first wave attack. The force consists of 50 level bombers (carrying 1760# armor-piercing bombs), 51 dive bombers (with 550# general purpose bombs), and the entire complement of 70 torpedo bombers. The attack aircraft are escorted by 43 Zero fighters. After spotting another periscope Ward, engages the target, a midget submarine, and sinks it. Japanese ambassador Nomura contacts Secretary of State Hull’s office and asks for a postponement of their meeting for 45 minutes. The embassy staff was having difficulties in decoding the message (a message which was already in Hull’s hands through US intelligence efforts). Trainees at the radar station spot a large number of targets 137 miles from Oahu. The crew did not report the contact as they were practicing after their normal training time (which ended at 0700) and they thought they were either mistaken, the B-17s expected in from the mainland or planes from the Enterprise. Admiral Kimmel, commander of Pearl Harbor, is informed of the engagement between the Ward and the suspected Japanese submarine. He and his staff conclude that it is just another false alarm. Admiral Kimmel decided to go to his HQ to clarify the situation but admitted that he hoped it would all blow over as he and General Short had a regular Sunday morning golf game scheduled. 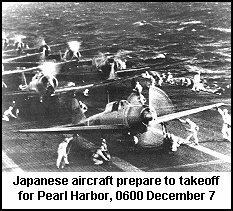 Admiral Nagumo launches the second wave of planes at Pearl Harbor. This wave consists of 54 bombers, 80 dive bombers, and 36 fighters. General Yamashita’s invasion force arrives off the coast of Malaysia at Kota Baharu and begins the bombardment of the 9th Indian Division’s positions in preparation for landings. Japanese bombers attack the various airfields around Pearl Harbor, causing a great deal of damage to the tightly packed aircraft. 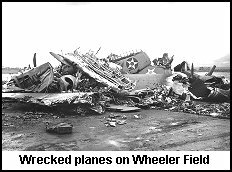 Wheeler field is hit particularly hard in the initial attacks but none escape attention. Pearl Harbor’s air support is wrecked in the first moments of the attack. 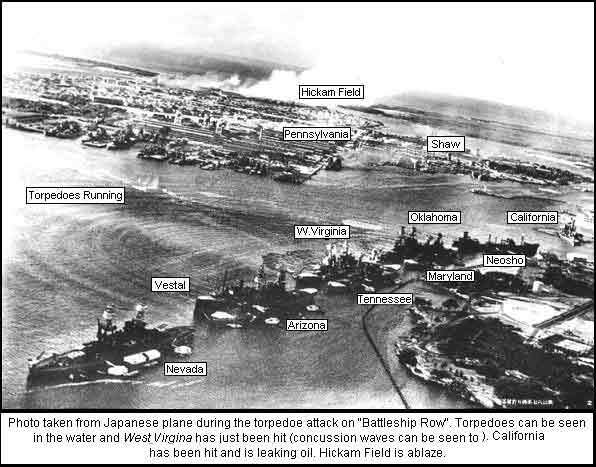 the harbor as bombs are observed hitting the southwest hangers on Ford Island. The Tennessee immediately takes two bomb hits, one penetrating in front of turret III causing a major fire on her stern. The West Virginia takes 3-4 torpedoes that causes serious flooding and also takes several bomb hits that start fires on her quarterdeck.Arizona is hit by several bombs including one that penetrated the deck next to turret IV. She immediately goes down by the bow, starts leaking massive quantities of fuel oil and major fires start throughout the ship. Okalahoma is hit by three torpedoes that tear open her port side hull. She takes on a 45o list. The cruiser Helena is struck by a torpedo which causes serious flooding. The cruiser Raleigh is hit by a torpedo, takes on water quickly, but immediate counter flooding saves the ship from capsizing. Nevada is struck by a torpedo. West Virginia takes another torpedo hit and immediately takes on a 20-25o list to port. Two more torpedoes hit Oklahoma, but because of her list, they hit the belt armor. The additional damage is sufficient to start her rolling more. Anti-aircraft machine guns open fire on the attacking aircraft. The target ship Utah (converted battleship) is hit by a torpedo and takes on an immediate 15o list and continues to roll. News of the attack on Pearl Harbor reaches Washington. The universal reaction was that the report had mistaken Pearl Harbor for the Philippines, but the messages were quickly confirmed. Secretary Hull was preparing to meet the Japanese representatives. Although in a state of shock, he met them. After glancing at the document, Hull angrily said, “In all my fifty years of public service I have never seen such a document that was more crowded with infamous falsehood and distortions”. The Japanese diplomats beat a hasty retreat and as the door closed, Hull muttered, “Scoundrels and piss-ants”. Two torpedoes strike the port side of the California. West Virginia takes on a list of 21o list to port. Oklahoma capsizes and sits hull up with a 135o list. 450 of her crew are trapped. Heavy 3” and 5” anti-aircraft guns open fire on the attacking aircraft from the ships still in the fight. The California is hit by several bombs that cause severe flooding in the lower decks and cuts her power for guns and damage control. The West Virginia begins counter-flooding to keep her upright. A bomb penetrates the deck armor and detonates in the forward magazine of Arizona. The ship explodes, tearing the bow of the ship apart and tipping the forecastle forward. She settles on the bottom with a thousand sailors trapped below deck. Target ship Utah capsizes. Most of her skeleton crew escape. Two more torpedoes hit the port side of the California. The last of the first wave of Japanese planes, having expended their ordnance and exhausted their machine gun and cannon ammunition in strafing runs, withdraws. Tender Curtis spots a periscope in the harbor and immediately engages it with her 5” gun, scoring several hits. The California is down by the stern. Nevada gets underway and starts picking her way through the smoke and fires, moving down the main channel toward the sea. Destroyer Monaghan gets underway and begins to exit the port. A Japanese midget submarine fires its torpedo at Curtis. The destroyer Monaghan rams the enemy submarine, sinking her. The second wave of Japanese aircraft arrive and begin their attacks. A few Army P-40s which were able to get airborne and attack the enemy planes. With all guns out of action, her hull resting on the bottom, and fires out of control, the survivors of Arizona are ordered to abandon ship. A bomb hits Raleigh causing another fire to break out. 1939 are the most famous). However, this is not the problem here. The problem with declassifying documents from WWII is that there are literally hundreds of feet of documents that were classified shortly after the war in fear that the new enemy – the Soviet Union – might get something valuable. So the military, state department and anyone else with a streak of paranoia were allowed to place blanket classifications on those documents. By law, each must be reviewed by multiple levels of bureaucracy before declassification can occur. There is a quick and effective way to debunk this pathetic theory. FDR was and is the political icon of liberal Democrats. Imagine you are a political operative working in one of the more conservative Republican administrations (Nixon, Reagan, Bush I, Bush II, pick one, any will do) and you have a chance to destroy that man simply by releasing documents that are part of the national record. Would you hesitate for a second to leak this information? Thought not. What about “that man in the Whitehouse”? The hatred felt by many in the country before WWII toward FDR cannot be overstated. The conspiracy theorists line of “thinking” in this area centers on two concepts. First, FDR wanted war not because he wanted to fight fascism, but to hide the “failure of the New Deal”. The second concept is that FDR was a traitor to the nation before the war, he surely forced us into war to save his commie friends in the Soviet Union. I will not justify these paranoid dilutions with argument. There is no doubt that FDR wanted a united America to fight militarist aggression. There is no doubt that FDR was a skilled political operator who would take full advantage of any opportunity to advance his agenda. However, to claim that this is evidence of conspiracy is simply farcical. The real problem with all of this is that it is distracting. Many in this nation still feel that it was simply impossible for the United States to be completely and utterly fooled. For some bizarre reason, we find it more comforting to think that someone in a position of power in our nation was the clever traitor and helped our enemies to gain an advantage. Surly, no foreigner could match an American for imagination, ingenuity and cleverness. That arrogance was certainly the case before the entry of the United States into WWII. Throw in a side order of racism and you have a much clearer view as to how our government, particularly the military and state department intelligence services, could have underestimated the capabilities of our potential enemies. 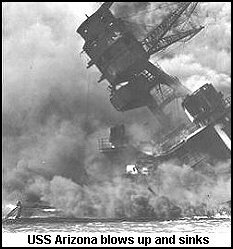 Poor communications, an inefficient intelligence gathering and dissemination system, poor rules of engagement and a totally inadequate command structure is what caused the Pearl Harbor disaster. It was not a conspiracy. It was simply a nation and a government operating on inadequate information making assumptions that were not valid about an enemy who was more capable than we had anticipated. This level of arrogance still pervades the country today. The 9-11 attack is a classic replay of the failure of our government to act responsibly. Just as I am sure that FDR hating conspiracy nuts will continue on their ignorant path, there will be those from the Bush hating side of the coin who will see conspiracies in that man. In the end, the failures are quite clear and easy to analyze. However, we as a nation will always be unwilling to face the reality that others who hate us, may be willing and able to strike at us in ways that we did not anticipate. This insures that similar tragedies as Pearl Harbor and WTC will occur again. That is the real conspiracy. Before the people of the United States had the Kennedy assassination to wonder about, the most popular conspiracies revolved around the bombing of Pearl Harbor. Few were spared the wrath of the theorists. An ocean of ink has been spilled explaining how just about anyone was privy to just about everything and intentionally withheld information from everyone else so that they could get what they wanted. Frankly, it’s all a bunch of bilge. The basic fact is that no one had all of the information they needed to come to any specific conclusions. Like most military/political disasters, communication of information, assembling that information in a meaningful way, and disseminating that information fails. That was the case at Pearl Harbor. But just for fun, let’s look at some of the popular and enduring conspiracies still revolving around the Pearl Harbor attack today. Did “they” withhold critical information? Since WWII, there has been a great deal of information regarding the Allies ability to break the various enemy codes. The conspiracy theorists claim that various elements (Roosevelt, Churchill, even Stalin – just pick one) wanted America in the war so badly that they intentionally withheld information and left Pearl Harbor so defenseless that the Japanese couldn’t pass up the opportunity. This family of theories is difficult to disprove, not because they have any validity, but because they involve digging out facts. It is far easier to come up with some outlandish theory, find a few scraps of evidence to support that theory, and choose to ignore any and all of the volumes of evidence that contradict your theory. With persistent and unbiased analysis, each and every one of the ludicrous hypotheses has been proved false. The confusion in this area has one basic reason. Those who develop the conspiracy theories have limited knowledge of the methods and practices used in signals intelligence work. This area of intelligence gathering involves a great deal of effort and work, often for incomplete messages. It takes time to decrypt a message, even if the “code” has been broken. It takes time to translate the message from the originator’s language to English. Once all of this is done, the translation needs to be verified and “cleaned up”. Once all of this is done, an analyst has to determine if the message is important. If the analyst deems it worthy for attention, the message advances up the chain of command where any one of a number of individuals can bury the message before it is seen by anyone who can actually take action. Add to this the fact that there was no central clearinghouse for message analysis (the navy, army and state departments all had independent operations), it is no wonder that no one had a clear, let alone complete picture of the messages available. In the specific case of the attack at Pearl Harbor, a great deal has been made of the “14 part” diplomatic response to the U.S. ultimatum sent to the Japanese embassy in Washington on December 6. This message was quickly translated and sent up the chain of command. However, those who could actually take action, chose to ignore the importance of the message, not from some conspiracy of silence, but a simple desire to not stick their neck out on yet another false war warning, or in the case of General Marshall, the inability to write a concise and clear message. There was no conspiracy to hide information, since there was no intelligence on the subject to provide. What about Kimmel and Short? far more important to assess blame than to understand a problem and fix it. Both Admiral Kimmel and General Short were held accountable and disgraced by the events of December 7. Interestingly, General Macarthur, who also lost the bulk of his command, not to mention the Philippines went on to be a war hero. The way Kimmel and Short were treated was shabby. America demanded a scapegoat and the government gave them two. Even if they had had information regarding the attack, they would have needed to have several hours, if not a day or two to come up with a workable plan. Quite frankly, if Kimmel had sortied his fleet on the night of December 6, as had been discussed, the catastrophe could have been even worse as the ships would have been sunk in deep water, where salvage and rescue would have been impossible. Short’s case is a bit harder to defend in that he did neglect the most basic patrol and security arrangements for safeguarding his forces from an external threat. Although it is the responsibility of the local commander to safeguard their troops, it is also often not their fault when things go wrong. Stark and particularly Kimmel could have done little more than they did. They did not deserve to have their reputations and careers ruined. When Pearl Harbor was attacked the carriers Enterprise and Yorktown were returning from Wake Island and Midway. The conspiracy theorists claim that, the “old and obsolete” battleships were left as bait while the “important and vital” aircraft carriers were hidden. This is without a doubt the feeblest of the claims of the anti-FDR crowd. Since the turn of the century, the battleship was the dominant feature in all the world’s navies. With the increasing influence of airpower after WWI, naval strategists started looking at aircraft carriers. In the interwar years, there was a small, but vocal cadre of aircraft enthusiasts who believed that aircraft would dominate naval warfare. However, the military, and the navy in particular, do not take to new ideas well. After several trials, demonstrations, wargames, the utility of carrier borne aircraft was demonstrated well enough to build some of the ships and include them in the fleet, However, these ships were used strictly to support the battleline of battleships and heavy cruisers. Their roll would be to scout, set up air defense (to prevent enemy reconnaissance) and to raid lighter craft. Even in the Japanese navy, these ideas were well in place. All of the plans for action in the southwest Pacific had the fleet supporting landings and then waiting in the Philippines for the USN fleet to arrive for battle. In this battle, the Japanese carriers were intended to harass the Americans on their approach, but not to be used in a strike roll. Yamato’s plan to cripple the American fleet at Pearl Harbor was not very popular with the majority of the IJN leadership. It was in essence, viewed as a high risk endeavor, but it was also the only plan that anyone could come up with that took the initiative in attacking the American fleet. So, no navy anywhere in the world had viewed the carrier as the main force for projecting power. A huge debt is owed to Nimitz and Halsey for developing the methods of using carriers as a main strike element. But in the end analysis, Halsey and Nimitz were forced to do this because they had no battleline to fall back on. The absence of American carriers at Pearl Harbor is not a conspiracy. What about those unreleased documents? Cost of Complacency - The Aftermath of Pearl Harbor the war, was decommissioned April 3, 1947 and sold for scrap July 8, 1959 to Learner Co., Oakland, Ca. West Virginia was refloated on May 17, 1942 and moved to Drydock Number One on June 9. Upon further inspection, it was found that seven torpedoes had exploded in her hull. Seventy bodies were also discovered and it was determined that some of these men survived until December 23.After temporary repairs were made, she was moved to Puget Sound for modernization. In September 1944, she returned to the fleet and participated in several actions. She was decommissioned January 9, 1947 and sold for scrap 24 Aug 1959 to Union Minerals and Alloys Corp., New York. Nevada was refloated February 12, 1942, and underwent repair and modernization at Pearl Harbor and Puget Sound Navy Yard. She returned to the fleet in time to participate in the capture of Attu. She then went to Norfolk Navy Yard for modernization and in April 1944 returned to the Atlantic fleet and participated in the Normandy Invasion and other actions for the remainder of the war. Nevada was a target in the atomic bomb tests at Bikini Atoll on 1 and 25 July 1946 which she survived.She was decommissioned April 21, 1948 and sunk as a target 40 miles off Pearl Harbor July 8, 1948. Oklahoma was righted, raised, and entered drydock on 28 Dec 1943. Stripped of guns and superstructure, she was sold 5 Dec 1946 to Moore Drydock Co., but sank 17 May 1947 540 miles from Pearl on her way to San Francisco. Arizona was a total loss. Her after guns, some AA machineguns and minor fixtures were salvaged. She was stricken from the Naval Register on 1 Dec 1942. The hull remained in place as a permanent grave for those who died on her and a memorial was erected around the wreck. The Arizona Memorial was dedicated 30 May 1962. The losses suffered at Pearl Harbor were a severe blow to the US military. 2403 were killed and this included 68 civilians. 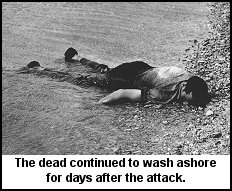 1178 were wounded. Airpower in Hawaii took a beating as naval aviation lost 13 fighters, 21 scout bombers and 46 patrol planes. The Army air losses were even higher as 18 bombers (including 4 B-17s) and 59 fighters were destroyed. Of course, the loss in fighting ships great. All of the battleships were damaged, all but two were either total losses or severely damaged. In addition to these losses, 3 light cruisers and 3 destroyers were also destroyed. However, the disaster was not a complete rout. 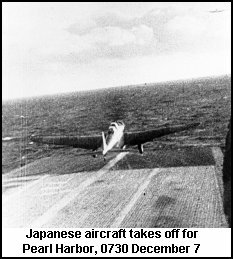 The failure of the Japanese to launch a third raid saved most of the naval facilities and infrastructure. The maintenance and repair facilities were nearly undamaged and the all-important supply of oil in the tank farm was intact. The loss of either of these facilities would have made the forward defense of the Pacific a very difficult, if not impossible task. But the story of Pearl Harbor is the battleships. Some were gone forever, but most still had life in them. Pennsylvania completed her overhaul that had started before the attack and sailed for San Francisco on December 20, 1941. After undergoing repairs, the ship returned to active service on coastal patrol and training in March 1942. On April 23, 1943 Pennsylvania sailed for Alaska to take part in the Aleutian Campaign and participated in several operations in the war. She was a target in the atomic bomb tests at Bikini Atoll July 1 and 25, 1946, which she survived. She was decommissioned August 29, 1946. and sunk off Kwajalein February 19, 1948.
with Pennsylvania and Maryland, Upon reaching Puget Sound Naval Yard, extensive refit and permanent repairs were made. On February 25, 1942, she rejoined the fleet but returned to Puget Sound for modernization on in August. She again returned to active service on May 22, 1943 where she participated in amphibious operations for the remainder of the war. She was decommissioned February 14, 1947 and sold for scrap July 19, 1959 to Bethlehem Steel Co.
California was refloated on March 25, 1942 and moved to the dry dock at Pearl Harbor for repairs. On June 7 she departed under her own power for Puget Sound Navy Yard where a major reconstruction and modernization were done. She returned to active duty on May 5, 1944 where she participated in the invasion of the Marianas and fought in the Pacific for the remainder of the war. She was decommissioned February 14, 1947 and sold for scrap July 10, 1959.
might will win through to absolute victory. 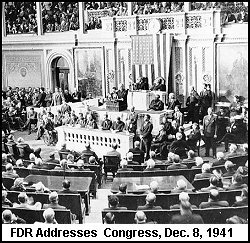 In a speech before a joint session of congress, President Roosevelt asked for and received a declaration of war against Japan. His words express the feelings of the nation far better than any of my words and his speech is presented here in its unabridged form. The United States was at peace with that Nation and, at the solicitation of Japan, was still in conversation with its Government and its Emperor looking toward the maintenance of peace in the Pacific. Indeed, one hour after Japanese air squadrons had commenced bombing in Oahu, the Japanese Ambassador to the United States and his colleague delivered to the Secretary of State a form reply to a recent American message. While this reply stated that it seemed useless to continue the existing diplomatic negotiations, it contained no threat or hint of war or armed attack.